2013 Rail of Lights Christmas Train. The Christmas Train rides are a tradition here in Jefferson TX. The ride through the woods seeing the bright stars, vignettes of Christmases around the world and hearing tales of Celebrations is just a fun thing to do during the Christmas Season. The train is decorated for the holidays; and in that spirit you can even take a picture with Mr. & Mrs. Clause or maybe even one with a member of our Riverport Ambassadors dressed for the season. The train cars are now pulled by an historic narrow gauge restored gas-powered Plymouth Locomotive built in 1964 reminiscent of Thomas the Train, the kids will love it. Ticket Prices: First Class $18; Coach Class: $15. Applicable sales tax applies. Lap children under 4 are free. First Class is offered in a beautiful historic, warm, enclosed coach. If you are riding Coach Class, be sure to dress warmly and bring a blanket, as you will be riding in open-canopied observation cars. 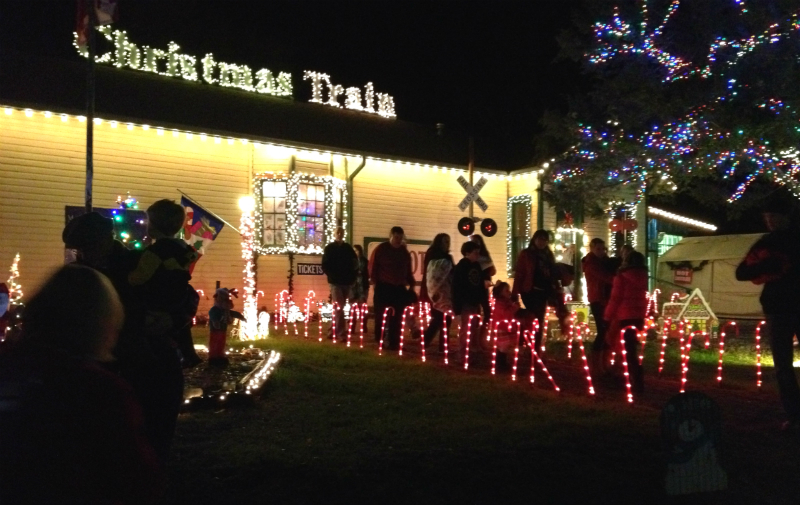 Be sure to buy your tickets early from the Rail of Lights website. This entry was posted in Christmas, Holidays, Train Ride by Tammy D. Bookmark the permalink.